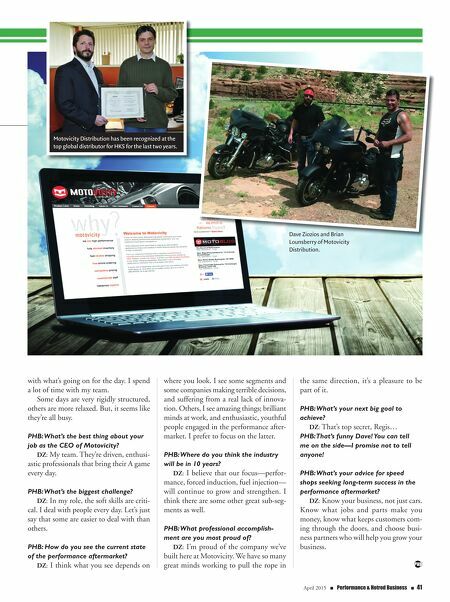 40 n Performance & Hotrod Business n April 2015 PERFORMANCE Dave Ziozios CEO, Motovicity Distribution By Regis Finn Meet Dave Ziozios PHB: I know you are a performance enthu- siast, Dave. What was your first car? DZ: A 1985 Ford Ranger. It was a two- tone, red and white, standard cab, 7-foot bed, 5-speed manual V-6. Great for donuts and burnouts! PHB: I'm going to pre- sume that is not your dream vehicle. What's your dream ride? DZ: Hmmm. Too many to choose from… it really depends on for what. I guess for fun, I'd love to have a third-gen Chevy C/K pickup. I love that boxy front grille. Heck, if we're dreaming, I'll take two—one lifted 4WD, and one slammed. A matched set. PHB: What type of picture would I find on your computer/phone wallpaper? DZ: Ha! A picture of a guy flat-track racing a long bike, probably 10-12 inches over front end with 14-inch ape hangers. I like it to remind myself to be tough… if that guy can flat-track a chopper, whatever problem I'm facing shouldn't be too tough. PHB: Who is the person you'd most like to meet? DZ: This would probably come as a shock to people who only casu- ally know me, but the Dalai Lama. PHB: Dave, please complete this sentence: If I wasn't in the per- formance aftermarket, I'd probably be … DZ: Finding some sort of way to sell something. I t is not often that I get to interview a friend. I first worked with Dave when we both served on the SEMA SPC (now the ETTN) Select Committee, then again recently when the manufacturing company I work for partnered up with Motovicity Distribution. 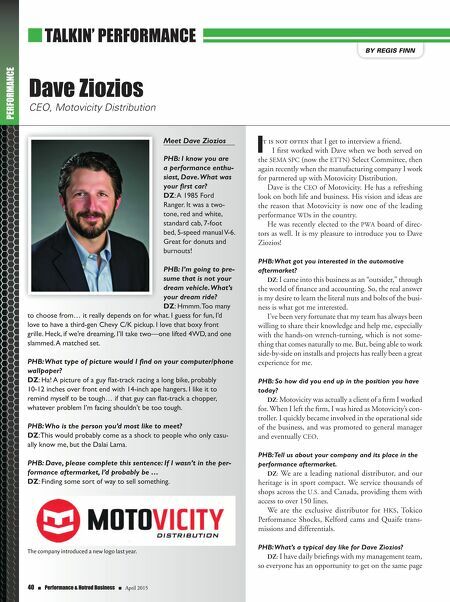 Dave is the CEO of Motovicity. He has a refreshing look on both life and business. His vision and ideas are the reason that Motovicity is now one of the leading performance WDs in the country. He was recently elected to the PWA board of direc- tors as well. It is my pleasure to introduce you to Dave Ziozios! PHB: What got you interested in the automotive aftermarket? DZ: I came into this business as an "outsider," through the world of finance and accounting. So, the real answer is my desire to learn the literal nuts and bolts of the busi- ness is what got me interested. I've been very fortunate that my team has always been willing to share their knowledge and help me, especially with the hands-on wrench-turning, which is not some- thing that comes naturally to me. But, being able to work side-by-side on installs and projects has really been a great experience for me. PHB: So how did you end up in the position you have today? DZ: Motovicity was actually a client of a firm I worked for. When I left the firm, I was hired as Motovicity's con- troller. I quickly became involved in the operational side of the business, and was promoted to general manager and eventually CEO. PHB: Tell us about your company and its place in the performance aftermarket. DZ: We are a leading national distributor, and our heritage is in sport compact. We service thousands of shops across the U.S. and Canada, providing them with access to over 150 lines. We are the exclusive distributor for HKS, Tokico Performance Shocks, Kelford cams and Quaife trans- missions and differentials. PHB: What's a typical day like for Dave Ziozios? DZ: I have daily briefings with my management team, so everyone has an opportunity to get on the same page n TALKIN' PERFORMANCE 40 n Performance & Hotrod Business n April 2015 The company introduced a new logo last year.